A donation receipt for $1000 from the Mr. Albert Shawn and family. 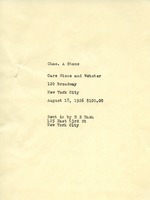 This is a receipt to George Howells of 11 Broadway New York City for $150. Mrs. Du Pont donates $100 to the Berry Schools. Donation receipt of $150 donated to the Berry Schools. 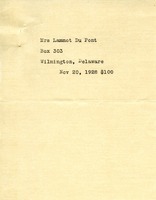 This is a donation receipt for one hundred dollars on an appeal letter from Mrs. James B Oliver. The appeal letter talks about needing more funding for dorm rooms. 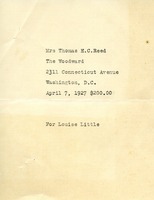 This is a donation from Mrs. Thomas H.C. Reed for two hundred dollars. 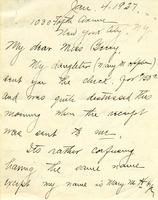 Mrs. Heplum writes Miss Berry to return a receipt for a donation her daughter had sent to the Berry School, and was mailed to the mother instead. 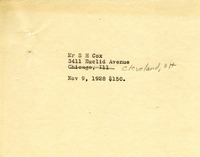 This is a donation receipt from Mrs. Caroline S Ross for one hundred dollars. This receipt states that Miss Louise Blake donated one hundred dollars to the Berry Schools. 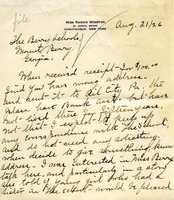 This is a donation receipt from Miss Mary L Jackson for one hundred dollars.